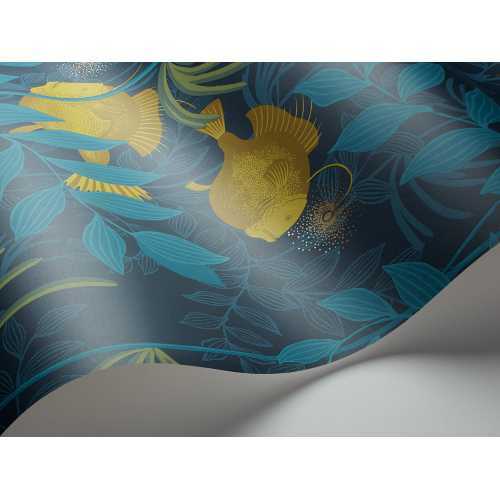 A bold undersea odyssey, this Nautilus wallpaper is a charming way of bringing an original twist to any interior. 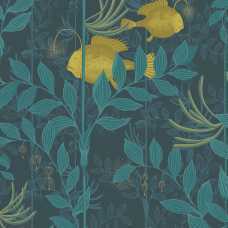 A pair of enchanting angelfish are at the heart of the design, surrounded by sea vegetables, fronds and a dreamscape-like background. Inspired by the depths of the sea, this Nautilus wallpaper is part of the Whimsical Collection by Cole and Son. The whole Whimsical range brings together enchanting and nostalgic designs inspired by the classic tales of childhood. A magical underwater world comes to life on your walls with the Nautilus wallpaper. Intricately and delicately drawn, the Nautilus design puts aquatic life at the heart of the design and it is a bold addition to any home. In this 103/4018 colourway, the design is picked out in deep indigo blue and the angelfish and other accents are picked out in a warm yellow. Each roll of Nautilus measures 52cm in width and 10 metres in length. It has a half drop pattern match and a 64cm pattern repeat. If you would like to find out more about the designers behind this piece and would like to explore the rest of their range, please visit our dedicated Cole and Son brand page.